Very Chic and Unusual Dark silver Sequin 1920's Gatsby Style Dress by Wallis. This truly is a fabulous dress that shines and swings as you move. 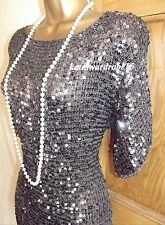 It hangs heavy, clings to all your curves and looks great on - sequins in a lovely dark silver colour - colour differs slightly to photos ( hard to capture). Lovely gold sequin mini dress / top from Wallis. WALLIS TOP TOP TOP - not dress. Stretchy so fits to your body. Good condition, may have the odd missing sequin but nothing noticeable. Very sparkly and great for a party or special occasion. Gorgeous Wallis Gold sequin dress. Lovely gold sequin mini dress / top from Wallis. Stretchy so fits to your body. Good condition, may have the odd missing sequin but nothing noticeable. More orangey gold than colour shows ( tricky with flash to get colour 100%). This is a beautiful dress from Wallis in a size 10. The main colour is ivory and it has a pretty animal print over it in a beige and black colour. The neckline is a crew style and there is a gold bar detail at the centre front for a nice finish with a small keyhole opening. 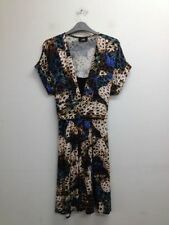 Wallis Stunning Beaded Shift Dress with Slip 16 BNWT RRP £85. Gorgeous colour which I would describe as Mink/Mocha. Lovely bead detailing to a sophisticated dress. Please note that beading detail does add to the weight of the dress. Measurements are approximate. Having a mass clear out so grab a bargain. To protect both parties the garment will be sent with Royal Mail 2nd Class to be signed for. Thank you. This is a stunning dress by Wallis size 10. make Supersized seem small. The dress has a cross over bust and it is designed to be fitted on the top half before flowing down to the hem. The dress will give you an outstanding look and reach you in excellent as new condition.